The hottest trend in rom-coms is sustaining a life-changing head injury. There was last spring’s I Feel Pretty, in which Amy Schumer is bonked on the head during a SoulCycle class and believes she has the body of a model, then there is Taraji P. Henson’s What Men Want out this month, where a head-smack in the club leaves her with the ability to hear men’s inner thoughts. 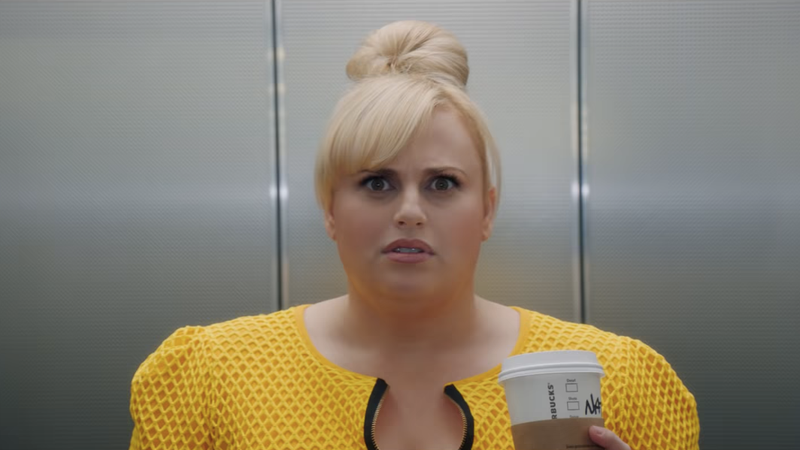 And now there is Isn’t It Romantic, which transports an incredulous Rebel Wilson to a fantasy designed like a romantic comedy, with New York transformed into a pastel pink, flower-filled paradise. But Isn’t It Romantic isn’t quite a romantic comedy, rather it wants to be the definitive anti-rom com, with lukewarm results. Wilson plays the cynical Natalie, who from a very young age adored classic romantic comedies like Pretty Woman but as a grown-up architect (she designs parking lots) despises them. Women in rom-coms are always pining for men to complete them, she complains, and women who should be friends are always pitted against one another. And why do these movies always write their gorgeous leads as clumsy? “In real life people would think she has muscular dystrophy!” Natalie says. In fact, Natalie’s hatred for rom-coms is really the only thing we know about her other, other than the fact she has a messy apartment, and is shy and needs to “open up,” as her assistant and friend Whitney (Betty Gilpin) tells her. She might prefer to exist outside the rom-com canon, but before she even gets transported into the movie’s genre fantasy, Wilson’s character is already working in the well-worn stereotype of the meek, socially inept Plain Jane who can’t even recognize that her male BFF Josh (Adam Devine) has a burning crush on her in the vein of Sixteen Candles’s Sam, The Holiday’s Iris, or Love Actually’s Sarah. When Natalie is mugged by a man on the subway she thought was trying to flirt with her, she hits her head and wakes up in a New York City freshly gentrified by love; her Brooklyn street is suddenly lined with wedding dress and cupcake shops, her unpleasant next-door neighbor Donny (Brandon Scott Jones) is now a stereotypically bitchy but helpful gay BFF, and her hot but unbelievably rude client Blake (Liam Hemsworth) suddenly only has eyes for her, so much so that he only ever calls her “beguiling.” “Did you just learn that word?” Natalie eventually asks, after the third or fourth time he’s said it. Her apartment is turned into a glamorous penthouse, with a closet filled with perfect designer clothes in her size, and the bathroom complete with a giant jacuzzi tub fit for Julia Roberts. Everything is so eerily perfect that in one scene an MTA worker is depicted cleaning the outside of a Metrocard machine. The horror! It’s all too much for Natalie, considering the rom-com life isn’t all it’s cracked up to be. Whitney has turned into a stylish, cut-throat competitor at work and a yoga ambassador-turned-swimsuit model named Isabella (Priyanka Chopra) has fallen for her Josh. Donny, the gay BFF, barely has a backstory or autonomy at all, just like the trope. “Is this how you get to work?” Natalie asks, as Donny takes her for a picturesque ride over the Manhattan bridge on his scooter. “If I had a job, yeah!” he answers, like a gleeful robot. She decides that in order to get out of this world she must have someone fall in love with her and vice versa, setting her eyes on the men in her storyline. Isn’t It Romantic is clearly trying to articulate how thin these comedies can be, but it doesn’t seem to take it’s own suggestions in the writing department. Wilson is a funny, dry narrator as Natalie (“This is like the Matrix for lonely women,” she says, as she tries to convince those around her that they’re living in a bizarre simulation) but she’s barely a real person other than a voice to say “this is so dumb!” at what we’re watching on-screen and remind us that men finally “look her in the eyes.” In a flashback in the beginning of the movie, a younger Natalie is chided by her mother to stop watching these romances, explaining that girls like her never get to be the leads. “They’d have to put Prozac on the popcorn” because it would be too sad, her mother jokes. Isn’t It Romantic is clearly trying to articulate how thin these comedies can be, but it doesn’t seem to take it’s own suggestions in the writing department. Poking at tired rom-com conventions by crystalizing them into a nightmare world is a funny set-up, but Isn’t It Romantic never leans too hard into a full-blown sendup of the genre. It wants to have its cake and eat it too; make fun of the ridiculous fantasies of these films but also portray many of them earnestly, like a karaoke scene in which Wilson charms the bar into a Whitney Houston song and dance number. The premise is begging for sharper teeth and some of the best jokes, like a repeated scene in which Hemsworth takes a phone call and over-performs his cute, clumsiness a la Hugh Grant to the point that he’s kicking over random objects in his vicinity, are buried underneath the movie’s more serious goals. The tone is always sort of teetering between satire and straight up rom-com, so much so that in a scene in which Natalie refuses to do a makeover montage, an audience member said disappointedly, “oh, she didn’t do it!” Given the wishy-washy commitment of Isn’t It Romantic’s satire, you really can’t blame her for expecting one.